Pansori is an artform in which a single performer sings in an expressive, emotional way, with a sole drummer providing percussion. It is used within the traditional Korean opera form of changgeuk. Female singers sing in a guttural, almost husky tone – a departure from the high notes of Western opera – which make them well-suited to retelling the Greek tragedy written by Euripides in 415 BC. In the classic tale, the women of Troy find their city burned, and their husbands and children dead at the hands of the Greeks in the aftermath of the Trojan War. Critically acclaimed director Ong Keng Sen is a household name in Singapore, having been the artistic director of theatre company TheatreWorks since 1988, as well as helming the Singapore International Festival of Arts from 2014 to 2017. He is known for his intercultural experiments on stage, such as Lear (1995), an Asian transposition of Shakespeare’s King Lear that weaved elements of Japanese noh theatre, Beijing opera, Thai dance and Minangkabau silat (traditional martial arts) together with contemporary theatre. Ong has brought his special brand of intercultural magic to his remix of Trojan Women, working with playwright Bae Sam-sik, Korean pansori doyenne Ahn Sook-sun, who composed the pansori, and music composer Jung Jae-iI. The theatrical opera formally opened LIFT 2018, and is presented by National Theater of Korea and National Changgeuk Company of Korea. What lifts (pardon the pun) the production to soaring heights is the company of 25 singers, actors and musicians, especially the 11 women who sing, wail, spit and cry in an emotional retelling of their fate as the slaves and concubines of Greek captors. 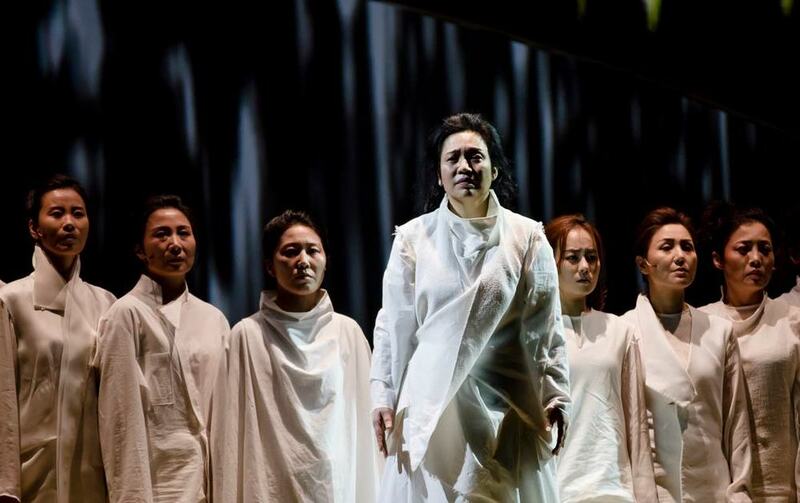 While Kim Kum-mi who plays Hecuba, Queen of Troy, and Kim Ji-sook, who plays her daughter-in-law Andromache, particularly stand out for their portrayal of anguished, grieving mothers and wives, the full impact of the piece comes via the chorus, channelling strength and resilience through the swell of unified voices. This is matched by the thunderous, rousing music, brought to life through instruments including the Korean drum buk and zither gayageum. With the murder of the last male heir of Troy, the women are frustrated by the limitations of their gender and robbed of the chance for future vengeance. They can only curse and swear but do little actual damage. The chorus thus serves as a chance for them to cathartically band together in voice and spirit. Dressed in impeccably tailored white robes, they represent not only Trojan but Korean women – the comfort women from World War II, as well as the modern-day ajummas, or Korean aunties who are one of the backbones of Korean society. At the same time, their struggles are universal. The production is well-served by the cavernous set, with its golden yellow steps and womb-like centre stage entrance, designed by Myung Hee Cho. It embodies the gradual elevation of the women – they do not cower but rise up against their captors. There are also projections – of galaxies, gushing water, fire – which are designed to bring some settings to life, but with the women themselves embodying the very height of rage, turmoil, madness and vengeance, it’s not entirely convincing that these are necessary. The exploration of gender continues with the casting of male pansori singer Kim Jun-soo as thousand ship-launching Helen, with an excessively made-up face and a toga showing off his slender body. The mid-show segment plays out as a farce: cuckolded lover Menelaus (Choi Ho-sung) threatens to kill Helen for leaving him for Trojan prince Paris, but is ultimately manipulated by Helen’s beauty and sweet words into sparing him. The queer love story is interesting and gives audiences a reprieve from the heightened emotions of the piece, but ultimately feel a little off. It is accompanied by a slightly cheesy balladic piano score which I took it to be part of the comedy, but it seemed like I was the only one laughing. There was also barely any reaction to Menelaus’ opening line, “It’s hard to live as a great man”. Historically, pansori was a populist artform. Back in the 17th century, it was thought to have been performed by shamans and street performers for members of the lower classes, before declining in prominence until a resurgence in the 21st century. By bringing it to London where it was performed at the Southbank Centre, I fear the production strayed too far from its roots, and risked being overly revered and exoticised. But then again, this could just be me, an Asian and a critic, reading too much into everything. The performance at the Queen Elizabeth Hall received a lengthy standing ovation. I rejoiced inwardly at the open adulation for what was essentially an epic display of female emotion. In ancient Greece, it was thought that women went mad as a result of their wombs wandering in their bodies (hystera – womb; hysterikos – of the womb). Hence, a woman’s fertility and her own body was a source of “madness” – emotional outbursts, sexual frustration, hallucinations. At the end of Trojan Women, Hecuba refuses to leave Troy, appealing to Mother Nature to swallow the women whole so they can remain on their land. You know this is impossible, but faced with these Korean ajummas with their wet eyes and resonant voices, you cannot help but believe in their attempt not only to reclaim their hysteria, but to wear it like armour. Trojan Women was performed at the Southbank Centre as part of LIFT 2018. Click here for more details.